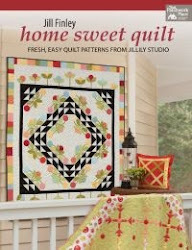 Home --All the Quilt-iness you could want! Almost a month. This might even be a record. All I know is that it has been so long since I wrote a post that I forgot how to get in here, so I have been even more delayed! Things have been crazy busy. As usual, but actually, more than usual. I have been creating up a storm, and it shows. Not in any actual finished projects, but in the huge mess I left in my studio. Last fall I had a photo shoot here at my home. (More about that later.) Yesterday I finally got the photos back to proof, and I was stunned. They are beautiful. Then I looked at my studio. Something is wrong with this picture. Too many projects going on at once!! I haven't seen the window seat in months. Shipments of products are all over. My designing mess has exploded. I still haven't unpacked from my last trip, (there was no where to put anything, anyway) there is a cutting mat under here somewhere. . . It was so bad it was getting funny. So I finished the deadlines I had, and today Sarah and I tackled the studio. We are not done re-organizing yet, but I can say that I do have surface area!! I had forgotten! Here is an "after" shot. Much better. I know you have seen this before, but I had to prove to you that I did clean up today. Now I can get back to sewing!! Can't wait! I have a whole bunch of projects to do for Market that is coming up next month, so I needed some space to THINK. And sew. I can't seem to concentrate when everything is a mess. How about you? Do you like to work in a clean space, or does it matter? After I found my sewing counter, I set up something new. Guess what I got? Yep. The good folks at BERNINA sent me a new machine to try out for a year. 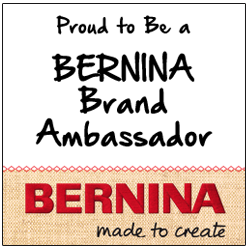 I am a BERNINA Ambassador--how lucky can I be?? My favorite sewing machines ever!!!! I have had two BERNINA machines before this and wouldn't sew on anything else! My first machine lasted me 20+ years, and actually, it is still sewing. It has a LOT of miles on it! My sweet husband thought I had it long enough and one day he came home from work early and took me to the BERNINA store to pick out a new machine. I love the new machine he bought me that day--it isn't very old, only about 6 or 7 years, and I will continue to use it a long into the future. * Extra long free arm. A full 10" to the right of the needle! 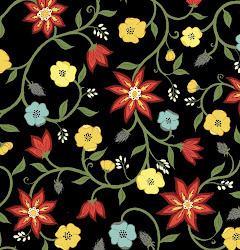 Great for quilting. * Dual Feed. You can engage it or not--to feed the top and bottom fabrics at the same time. * Stitch regulator. Free motion quilting sure is easy with this gadget. * Knee lift. A BERNINA feature I always love. 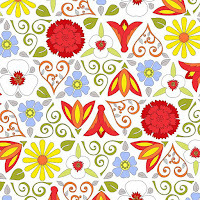 * 9mm stitch width for decorative and zig zag stitches. * the 9 Hook system--makes it run quiet and FAST. 1000 stitches per minute! But there is a draw-back. I don't know how to use it. I guess I will have to watch the video and take a class or two. It is a "sewing computer," and that can have a bit of a learning curve. Now that I have a nice clean space and room to sew, I'm sure I'll be stitching in no time! BERNINA is the "Cadillac" of sewing machines, and Aurifil is the "Cadillac" of threads. They are a great combo!! I feel so fortunate to be a representative of both companies. Because it has been so long since I wrote on this blog, I think I should reward you for coming back. Let's have a little prize give-away. 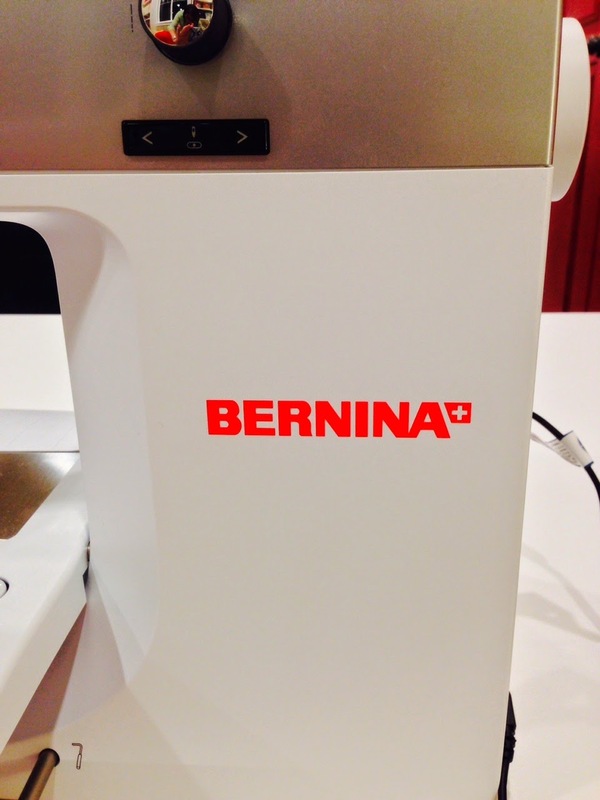 Do you own a BERNINA? Tell me what you love about it. And if you don't have one, tell me why you would like to get one someday. I'll pick a winner in a few days and send a prize package of Aurifil thread!! You will love it! Maybe I'll throw in a pattern or two. Good luck, and thanks for following! I've heard many great things about those sewing machines. Wish we had a dealer close by. Lucky you! getting to play with it for a year! I love everything about my Bernina! I could not wait to buy a Bernina when I graduated from college and got my first job over 30 years ago. I have a 830 and have been doing some paper piecing, so right now I love the thread cutter! I have a 440 that I take to classes. Berninas are so dependable. I am awaiting my Berna 750 QE as well. My current BERNINA is 12 years old. I am so excited a can hardly wait. Your studio is beautiful! I don't own a Bernina (insert sad face....) I have only ever heard good things about them! You are a very lucky lady to have the use of one! Enjoy! I've never owned a Bernina, but hear they are wonderful. I think the feature I would enjoy the most is the knee lift. Congrats on the fun year you'll have with this one! I do not have a Bernina but am intrigued by some of the features you mentioned. I'm just starting to do some machine quilting with my domestic machine so look forward to your reviews. Thanks for the chance to win the thread. I've heard good things about Bernina machines and wouldn't mind giving one a whirl one day. When I purchased my new sewing machine, a Janome, 5 years ago, I wanted to look at a Bernin, but there weren't any dealers in my area. I love my Janome very much, but if I ever need to replace it, I'm going to look for a Bernina, so that, at the very least, I can "test drive" one. I love the idea of the stitch regulator! I would love to try a Bernina, but like so many others we do not have a dealer. Have fun creating more beautiful things. I don't own a Bernina. I have heard really good things about them. Cost is one of the drawbacks for me since I don't sew for a living. Love aurifil thread. I would love to own a Bernina. The machine I have was given to me in the 70's and is the only sewing machine I have ever used. It's only feature is that it has zig zag stitch! I have a Bernina 440 QE and the stitch regulator feature gave me the confidence to tackle free motion quilting;)! I don't own a Bernina but used one in a quilt class once. It was wonderful! The next time I shop for a new machine I will definitely look at Bernina. The knee lift and thread cutter are both great features. I would love a Bernina sewing machine and your loaner looks just awesome. The knee lift really attracts me, plus Aurifil thread, my idea of heaven on earth. Wow I have always wanted a Bernina. When I see the tutorials that people have on the feet that Bernina has it makes me want one even more. I LOVE my Bernina! The thing I love best about it is all the great stuff I can do with it - it's so versatile! I love your studio. I would love a Bernina, I have just started quilting/sewing and my next machine will be a Bernina, the idea of a stitch regulator and the knee lift are exciting, I have heard so many great things about it. I also have heard so many things about Aurifil thread...Alas, I have never tried it, but really looking forward to what you have to offer in terms of patterns. I learned to "applique the Jillily way" with your kit, just recently and absolutely love it. Thanks for the great giveaway! I have a Bernina 1260 that I got before my third son (now 17) was born. It replaced my 830 which I passed on to my sister, and as far as I know, that one is still sewing too. My mom has an 830 that she bought in 1970 something. She is still sewing on it. Three years ago I bought my first son a 40 year old 830 to use for costume design. I love Berninas! And I agree about Aurifil too. I thought people were exaggerating until I tried it. No Bernina for me, but I would love to own one someday. My aunt let me use hers about 14 years ago, and it was life-changing, seriously! I went out and bought the best Pfaff I could afford, and I still love using it. I've just recently started using some Aurafil thread, too, and it greatly improved my piecing success with little blocks. I love my Berninas! I have 2! They are heavy, but I'd rather lug them around to classes than sew on anything else. 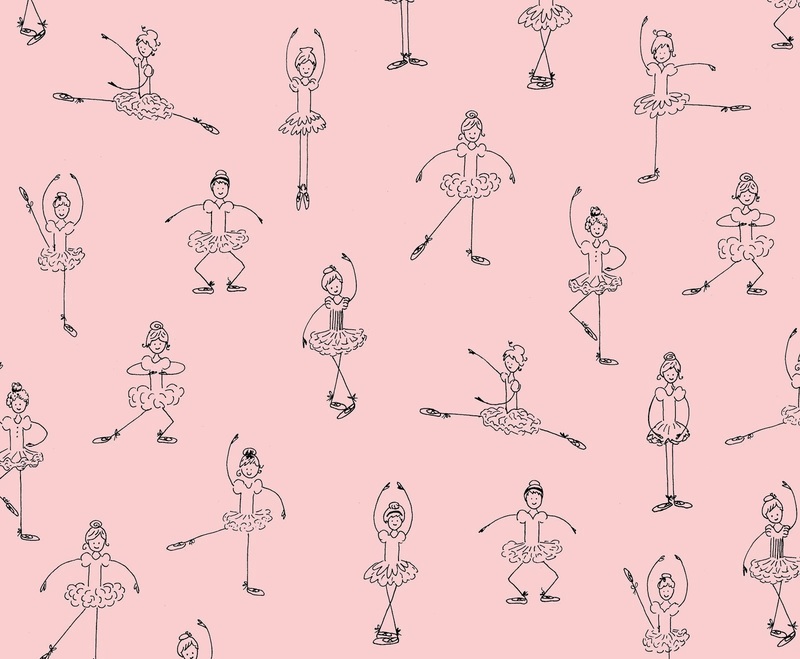 Your studio is fabulous! Yes, I have the Bernina 440 Quilter's edition. I love the needle down position, all the decorative stitches, the fact that I can lower my feed dogs, and the needle threader! I have a Bernina Virtuosa 160. I love that machine! It's gotten many miles in its over 15 years of use and is still going strong. I feel like I get a lot of precision with this machine. I can use any combo of threads, tension is always great. And, not that I do them much, but if I want to do a buttonhole, I just press the button and sit back and watch! I've test-driven a 750 at my LQS and fell in love! Sigh...maybe someday! I am on my third Bernina, and I wouldn't sew on anything else. The stitching is amazing, and so is the stitch regulator! All of my machines are still running beautifully, and they are true work horses. I have heard great things about Bernina but I don't own one. I might have to buy one though because those designer faceplates they had us voting on earlier this month were beyond cute! I have a Bernina. I love the inner workings are metal and not plastic (which is why they are so heavy), that the feet have to "put on" and that it is very dependable. I have two Berninas! First and beloved Patchwork 240, bought it because of the beautiful blanket stitch it makes, then discovered it is one awesome machine. I especially like how the fabric feeds into the machine,nice and smooth. Purr like a kitten..then along came that stitch regularor! so I added the Aurora 440QE! I am one happy camper,and have a machine for a friend to sew at the same time if needed. We have a wonderful Bernina dealer at Bits n' Pieces here in Wayne,MI. Always showing new ways to use the feet and total support. My Berninas are the backbone of my uilting/sewing. I have a Bernina Artista 630 and I love, love, love it! I bought it specifically to use the BSR and then the quilt shop I bought it from didn't give classes on it's use. I always so busy just sewing that I have never devoted any time to try to figure it out on my own. I expect I will someday and I'm just glad I have it (it's tucked away in a special spot in my sewing cabinet). Your studio is gorgeous!!! Thanks for the giveaway! No, I don't own a Bernina because I can't afford a Cadillac. =( But I do love Aurifil, which I can afford and would love to have more of. Thanks for the giveaway! I LOVE your studio! I adore the flooring!!!!! I have been on the hunt for a new machine since I got my current one a few years ago... it is not what I had hoped it would be : ( Now, I am going to look at a Bernina because you gave a great little review of the machine! And, no I cannot work in a messy space! I need my room neat and clean! Happy Easter!!!!! My first sewing machine was a Bernina, and while I am in love with the Pfaff I currently use, I have such fond memories of the machine that accompanied me on my first steps to becoming a quilter, my little Bernette. No, I don't own a Bernina, but would love to! I have a Pfaff that is now 16 years old. It's a basic machine. My next one will definitely be a Bernina. I'm just starting to learn FMQ and a stitch regultor, larger throat area and more bobbin capability would be great. As all of these things challenge me on my current machine. Love your sewing room! I have a Bernina 830. I love the machine but it can be a little challenging at times. Her name is Ruby (she is red) and she is a bit of a diva! She has great space for quilting and i do love the duel feed. I have never been successful with the BSR however, even after servicing. That is disappointing but she quilts well without it. I think this will be my last machine so i will have a good while to perfect myself in using it. My Lord these machines are getting pricey! What a blessing it is to have sweet Ruby! I have one fairly basic older Bernina. I would love to get one with the stitch regulator. I have 3 Berninas. I started with the top of the line at the time a 180e. I had to then buy a 440QE with the BSR (stitch regulator). I was bored just sitting there watching my 180 stitch away (if you step away something always happens) so I piece on my 440 while the 180 embroiders - makes me feel very productive! Then I got a serger. I am lucky, I have a Bernina dealer a half hour from me in NY and half a mile in AZ. Yes I do have a Bernina but It sits in its luggage while I use my Pfaff with built in walking foot. I have a Bernina 430 qe and a pfaff 4.0 expression. My sister loaned me her Bernina when I first started quilting. It was a little work horse. Unfortunately, she took it back and I haven't used one since. I have a fifteen year old QE 220 or something like it.....one of the Alex Anderson quilters edtitions. Funny you should mention getting a new model, because I have been condidering it. Wondering if I should get one that can embroider too.....love my bernina. Have fun. I have not owned a Bernina but have friends that love their machines. I think it would be great to own one some day. I have tried Aurifil thread and I do love it. I don't have a Bernina and don't think I have ever sewn on one. I would love to have a new machine, though, that has more stitches and room for quilting. 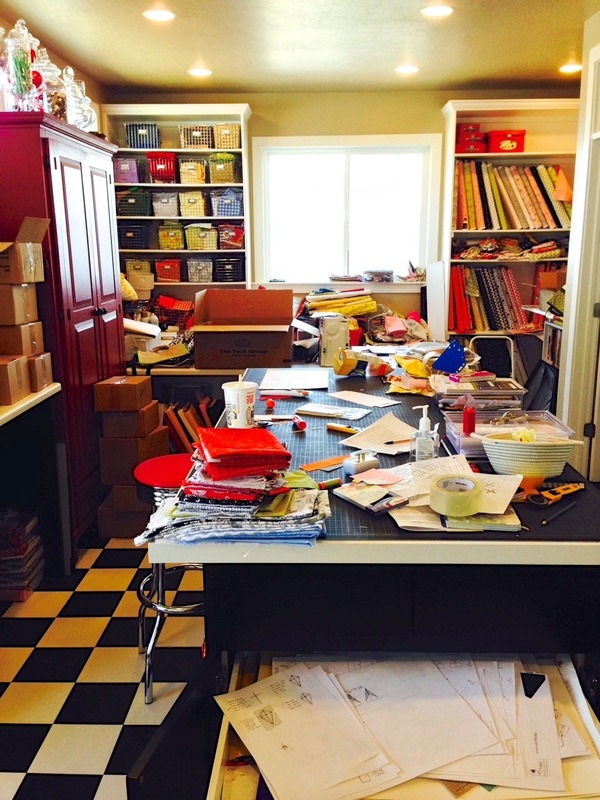 Your sewing space is beautiful--messy or not! I have a Bernina 440 and do love it, although I would like to have the new even feed. My favorite part would be the knee lift. Oh--and all the cool feet! Thanks for the chance to win some awesome Aurifil thread. I hope you can figure out your machine soon--it looks like a wonderful machine! I looked at my sewing room today and just closed the door and walked away...I will have to tackle that mess after Easter. I do not have a Bernina, but have only heard wonderful things about the machine. I would love to have features like the thread cutter, knee lift and the extra large bobbin sounds wonderful. So, maybe someday I will own one. I love Aurifil thread, it is the only thread I use and those combo packs are wonderful. I have owned several Berninas over the years. They are super machines. I've had a Bernina 1230 for over 15 years. It's a good solid sewing machine and I wouldn't trade it in for anything! I've never had a problem with it. I have a Bernina 440QEE and a B330. I love my Berninas! I use my 440 at home and having the BSR gave me the confidence to FMQ my big quilts. I use my B330 for retreats and classes. I wouldn't have any other machine. I love your studio and like you, I do best when mine is clean. 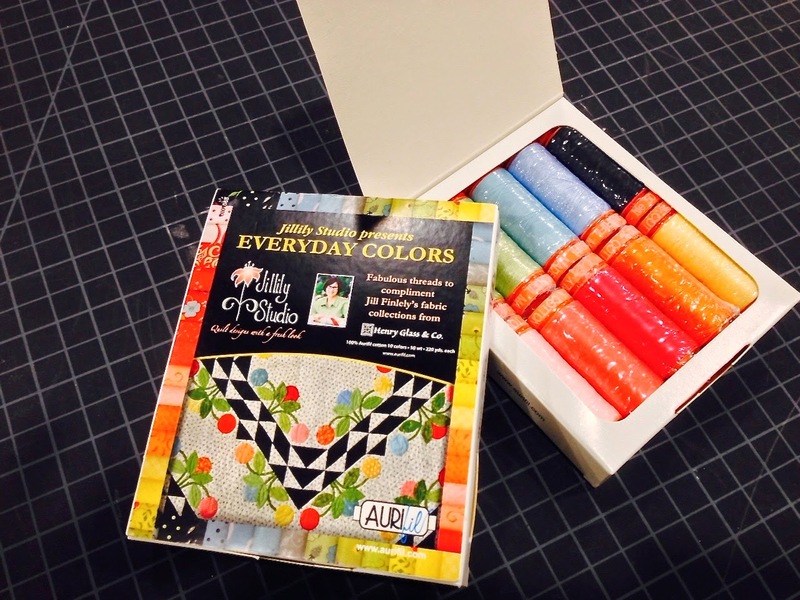 Thank you for the chance to win some great Aurifil thread. I have a Bernina 820 and I just love it. They are the best. I am looking for a smaller Bernina to take to retreats though. And, I adore Aurifil thread. My sewing machine is on its last leg, so I would love to purchase a Bernina for my next machine. I'm just not sure which one I want so I will interested to read your readers' responses to your question. Thanks for the giveaway! My sewing space looks like this right now too. I am planning to reorganize tonight. I have a husqvarna; it works for what I need it to do and the dealer is10 minutes away if I need help or service. So I would not crave a Bernina but some Aurifil would be nice, thank you. I have two Berninas; an old 830 and a 440 QE. Love sewing on them and some Auriful would be wonderful to win. I sew on a very old, very inexpensive Kenmore - but it has served me well and keeps on stitchin. I would love to have a new machine with a stitch regulator, a table and a needle down feature - I really want to start free motion quilting - the money I would save would pay for my machine....or if I win the lottery....I will just keep dreaming. Lucky you! I would love to own a Bernina someday if for nothing else, than the stitch regulator! But then I guess I need to learn how to free motion quilt! LOL I love your studio--mine is similar colors. That red hutch is beautiful. Thanks for the chance to win your thread box...it would be perfect for making a quilt for my craft room. I currently own 2 Berninas. My first one that I will never give up is my 150. That thing is a work horse and then my 640 which I am trading in for my new 750QEE that I ordered on Monday. Can't wait. Can't wait to hear how you like it. Congrats on cleaning your studio - I know that's a big accomplishment! LOL! I don't own a Bernina, but know that they have great reputations! I have a Bernina. Actually it's my second one. I gave the first to my daughter and she uses it often. I wish I add one of the ones that makes your quilting stitches even when free motion quilting, but I purchased mine just the year before they became available. That said I love my machine! Thanks for the chance on your wonderful giveaway!!! I dream of owning a Bernina someday..I tried one at my local dealer and fell in love!! I would love to replace the inexpensive Brother machine I use now. I have never tried Aurifil threads either (sad face) and would really like to...I keep hearing how wonderful they are. I do have a Bernina! I inherited my mother's old 830, and it's a workhorse - new in the 80's? I splurged and got my daughter a Bernina 350PE for her wedding... but she is not sewing with it so it came to live at my house and I sent her the old one... She may not get it back. These machines can stitch through anything! Your studio looks amazing. Such a happy place to come in and be creative! I own 3 Berninas. Each time I told my husband I would sell the old one but I couldn't part with them. I have the original 830, a 150QE, and a 440QE. My darling grand-daughters are beginning to sew so the plan is to give two machines to them...if I can part with them. Bernina and Aurifil....like you said...great combo. I have had a Bernina since 1980. Love, love, love, them. They sew every time you sit down to sew no matter how long in between times and they make the prettiest stitch. I still have my original 830 and the newer 830. I have had a 1630, traded for a 180, which I traded for a 200 - kept the 200 for retreats when I bought the 830. I bought a Bernina 830 when I was in high school- this is the one before computers. Now I am a grandma and it is still running well. When I retire I am thinking of buying a new one. I don't have a Bernina, just a small "starter" Brother. I would love more throat space, an dive heard great things about Bernina. I have used Aurifil and I LOVE it!!! I don't have a bernina, I would live to own one tho! Not sure if I like the built in stitch regulator, the large throat space, the bigger bobbin...don't know which I would like best! If I could afford one I wouldn't have to pick! I'm new to quilting. I was inspired by the birth of my granddaughter last September and now I'm hooked. 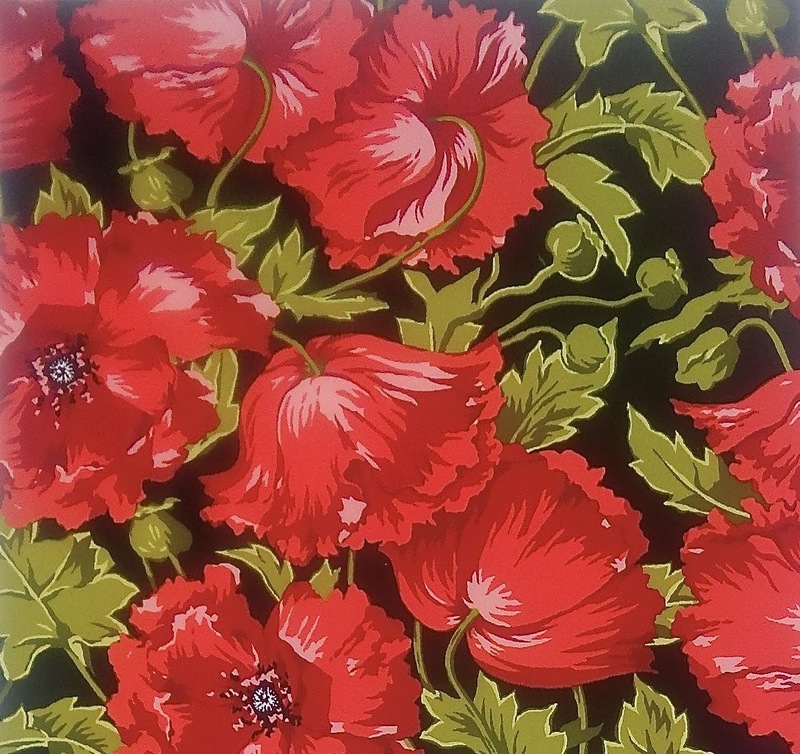 When I decided to start quilting I drug out the old bottom of the line Brother that my husband bought for me at Walmart. *sigh* I would love to have a Bernina one day. A Bernina 1020 (mechanical) has been in my life for 23 years and I wouldn't trade it. Often, I use it to sew seams on projects while I stitch on the Bernina Arista 640, which arrived 7 years ago when I became enchanted with home embroidery. My granddaughter and I have fun stitching out designs on her clothes and I use it to personalize gifts. Creative sewers create "clutter" when focused on new projects. Love your applique technique! I do not own a Bernina but I would love to some day. I have heard so many great things about them. I'm saving for a Bernina for when I retire and have a lot of time to sew. Your studio looks amazing! I'd love to have one as nice! Thanks for the giveaway! I am in desperate need of a sewing machine. I can't even FMQ on my old Kenmore. A Bernia would be a dream! I have a Bernina 640 and a 780. Love them both and use them often. The 780 isn't a year old and already has 5 million, yep million stitches on it. I've only ever owned a Bernina..I purchased my first one in 1997, a Bernina 1080 which has proven to be a veritable work horse over the years...and is still going strong. Then last May my husband gifted me with a 750QE and all I can say is WOW! I am still learning all about it because the closest dealer is over 150 miles away so I'm basically teaching myself how to use it. Aurifil is my favorite thread and Bernina is my favorite machine. A match made in heaven, don't you think? Oh, and I almost forgot to add...your studio is a DREAM! I had a Bernina 730 record from 1960's. Very strong and well made, they are indeed quality machines. By the way, great job on cleaning up your room! I don't own a Bernina but I have heard great things about them. I love Auriful thread and it works great on the machine that I use daily. I have an older Bernina and it still is chugging along. It just purrs and runs smoothly. I wouldn't sew without my Bernina. I am the proud owner of 2 Berninas, 710 and 330. My 1530 died and I was able to buy these last year. I love the fact that Berninas are "work horses," they are BEAUTIFUL to look at and can always get the job done. I do not own a Bernina but if I could afford one I certainly would. Maybe someday! I do not nor have ever owned a Bernina. I've been seeing great comments and I have tried one at a relatively local quilt shop. The stitch regulator is amazing. I love piecing quilts but I dread finishing them, even the smaller 12inch hanging with free motion. I have the most issues with inconsistent stitching or thread snaps and a Bernina is on my bucket list... one day. Thanks! I do not have a Bernina, but almost everyone I sew with does and they love Bernina. I do sew with Aurifil and can't go back to any other thread - it's the best. I have a Bernina 440QE and I love my sewing computer. I love everything about it. I hope it is the last machine I ever own, but if not, I would definitely buy another Bernina. I do not have a Bernina but it is my aspiratial/dream brand. I think it is always good to have things to work towards, right? I just upgraded my Janome through my Aunt. The Bernina has so many attractive features that are in my dream machine. Thanks for hosting the giveaway! I have never owned a Bernina but I have seen them sewing and they look so sturdy and reliable. I especially like th minimatic old Berninas- I'm pushed for space but I'm sure I could squeeze one int somewhere! I don't own a Bernina. Maybe one day I will as my "grown up" machine as I am currently using a Singer. Thanks for the chance to win some great thread. I used to own a Bernina 380 and traded it in on a used 440QE. Love both machines! I need to take lessons to learn the stitch regulator and embroidery. I am lucky to have a great Bernina dealer near by. The first machine I ever sewed on was a Bernina. A family friend had one and taught me to sew using it when I was in middle school. I do not own one as I just got back into sewing recently and the cost was a factor. I am saving for one and hope to own my own within a year. I would love to try a Bernina I have heard many good things. 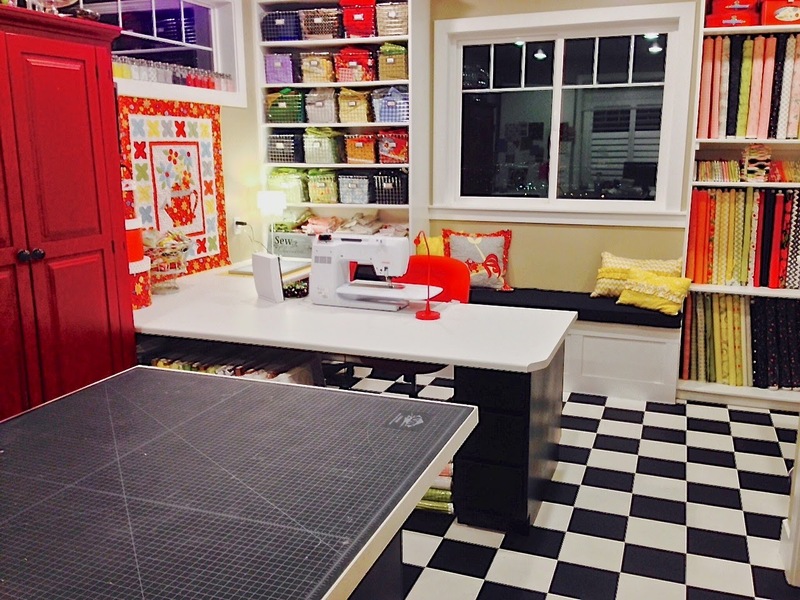 Your sewing room is making me jealous. I don't have one BUT my Mom had always wanted one, and got it a few years back. She couldn't be happier with it! I have always wanted a Bernina..I am green with envy...I love Aurifil and am very busy making quilts for my sisters (4). My little old Singer will have to do for a few more years. I own a Pfaff because I wanted a new machine that also embroidered....and it was super on sale! I have the 440QE and love the knee lift. I don't have a Bernina, but I would like one I think. When I see youtube videos, they seem to run so smoothly and quietly with great stitches. WOW!!! What an amazing studio. I don't work well in a messy area but can't work without being messy! Need to organise my sewing stuff better which I hope will be easier once I move it all into the spare bedroom. I LOVE LOVE LOVE my Bernina Activa 230 but struggle when quilting large project so I am looking forward to hearing how you get on with your new machine. I have this same machine and it took me forever and 4 classes to get comfortable with it....but I LOVE it. I got the embroidery unit too...well, it will be ALL mine in a few years;/ I have a 230PE also that I haul around...I don't even have a bag big enough for the B750! I own a Bernina 820 and I love to machine quilt on it! I also love to piece and quilt with Aurifil thread too! I love my berninas. I have an 86e and a 200 that is upgraded to be like a 730. I love the way the 86 pieces and the way the 200 embroiders. I don't have a Bernina but take all my classes at the Bernina store! Love them. I would love to see a Bernina up close and personal. Wish there was a close trustworthy dealer. BTW the studio looks great! I don't own a Bernina, yet! I am hoping to replace my machine with one later this year! I don't have a Bernina but saw one at the March Lancaster quilt show. I would love one! It is on my Christmas list. a bernina (and its lovely 10" of space) is my dream machine. i just got a used husqvarna and am liking it, but i know it's not a bernina!! I don't own a Bernina but I have heard nothing but great comments about them. That is why I would like to own one some day. I love Aurifil thread too. I recently bought a used 1968 Bernina. I had heard people saying how awesome they were--I have previously owned singers and brothers. They really are the cadillac, now I just need the cadillac thread! Love, love my Bernina. I'm on number 2. Not because the first one stopped working. I with the first over 20 years old, I wanted a new one. Used my daughter's Pfaff recently and there were so many features I didn't like. BTW my studio looks the same way when I'm creating! I have an older Bernina 1090 that I love. It's my traveling machine! Does this count. I would love to own a Bernina! Bernina quilts beautifully. I learnt to sew on a Bernina many years ago at school, I am currently sewing machine hunting and I have bernina on my short list for the FOQ's to have a play on. I have a janome at the moment. I have read quite a lot of brilliant reviews over berninas and think I might need to try one! Hi,what a neat new Bernina! I'm so envious! Yes, I have a Bernina 210 and love it! It stitches so nicely and yet is a real 'work-horse'! O want to thank you+Aurifil for a great giveaway! 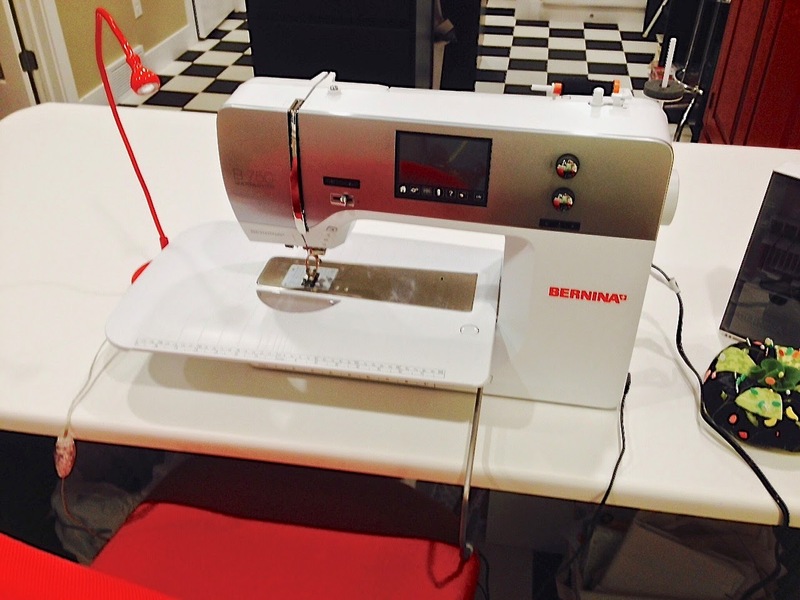 Enjoy your new Bernina! I have two Berninas that I love. The one I use the most is my 440QE. Have really become accustomed to the stitch regulator when quilting. Would love to upgrade to the dual feed model so I would not have to stop and change to the walking foot. Thanks for the give away. I would love to have a Bernina! Have NEVER sewn on one, but everyone with one is in love with it! I would love to be in love with one of my very own! I truly love Aurifil thread, too! I have several colors of it because I belong to a Aurifil spool of the month club and receive 2 spools a month! What a beautiful studio you have - whether it is covered in projects or not! Thanks for sharing! I do not have a Bernina but would love one. The phrase "Nothing sews like a Bernina" is something that I frequently think about whenever I'm having trouble with the stitching on my current machine! I would love the precision stitching, the knee lift, the stitch regulator, and all the stitching features. I want an 820 so bad, I can tsste it! NOTHING sews like a Bernina, NOTHING! AND Aurifil is like butter on a freshly baked loaf of bread. Sure would make some fun FMQ in my future. I really really like your studio, glad you can test drive the bernina. I have a brother, this is my second one, my first one was bought in 1979 and is still working. I have heard good things but don't have a dealer near by. Thanks for the chance to win some thread. I don't own a Bernina but have heard great things from a close friend who has one. At the end of January this year, I purchased a 1230 specifically because of the awesome applique (blanket) stitch it does. It's opened up a whole new world to me! Your studio is awesome!!! I don't have a Bernina but since I heard so many great reports I wanted to purchase one a few years back. Unfortunately, we don't have a dealership in the closest city to where I live, so I had to choose a Pfaff, which I am very happy with! I have a 1630 Bernina that I love. I bought it when my first grandchild was about to be born. Even though it is still a great machine I would like to have a newer model. I think the Bernina is the best machine on the market. I love Aurifil thread also. I have a Bernina 8320 that I love. It's probably my third Bernina. Since I travel out of town to care for my grandson several days a week, I wanted something a bit lighter, so I got a really good deal on another brand (not a cheap machine, however). Just was not the same, I sold it to the daughter of a friend (for my purchase price) and she loves it . I bought a Bernina 750 PE and am not a happy camper!!! I want to get a Bernina because of the stitch regulator. Your machine looks fantastic. Have fun. I have a Bernina Serger (MDA 1150) which I love. I bought my Bernina 1130 at Vermont Quilt Festival in 1990 -- put it on layaway for the year and picked it up at the next show. It has only needed repair once -- when a granddaughter used the long slot on the front as a slot machine coin deposit. Occasionally I think about a new machine and it says to me "Why? I do everything you really need me to do!" Maybe someday I will own a Bernina. I have heard great things about them. You are lucky to have a job where they just send you one!! I don't have a Bernina though most of my friends do. It hasn't been in the budget, especially since I recently went through a divorce at 60+years of age. Maybe some day. My children tell me it is time to do some things for me. I don't own a Bernina but that dual feed sounds great! And a bigger bobbin. With the amount of sewing I do, I would certainly appreciate that. Thank you for the giveaway- I LOVE Aurifil thread. I don't have a Bernina but would love to try one out, I always hear wonderful things about them! I have a bernina 580 which I love. The stitch regulator is wonderful! I bought my Bernina 550QE two years ago, before that I was always a Singer girl. I love this machine. It sews so smoothly and will stitch thru just about anything. Couldn't live without the walking foot and I'm getting better with the stitch regulator. I love your clean sewing room and strive for the look as well. But every time i clean I lose something wanted to give away. I don't have a Bernina but all my friends do. I have 3 janomme's . I am drooling over the Bernina. They make quality machines and I would so love to have one someday. For now, thanks for the giveaway. Wow, your workspace is incredible! I wish I could say that I own a Bernina, but sadly, that is not the case! However, I only use Aurifil, so thanks for the chance to add to my limited supply!! I love everything about my Bernina B550QE. I especially like how easy it is to change the feet on Bernina machines! No screwdriver required! I have my mom's old 1090 and it's a workhorse! It's my only machine and it still works great almost 20 years later! My dream machine is the 750 for all the reasons you gave, especially the large throat space! One day! Thanks for the giveaway! I've only tried Auriful once and loved it! I love my 430. I live the knee lift. Love that the tension is always on, unlike some machines. Love that you can set the memory to your stitches and it will be there to go back to I case you forgot what you were using. The the variety of stitches and love the fact that sewing ten hours straight the last two weeks I had absolutely no problems. Nice to have a machine that runs smooth like butter. I can't think of just 1 thing about my Bernina that I LOVE because I LOVE everything about it and I also have more than 1 Bernina. I'd love a bernina, but can't afford one. I'd love all the wonderful features they have. I have a Bernina Artista that I bought used from a friend. I don't sew on it - I only use it for embroidery and it does a wonderful job! I just wish that the book was a bit more user friendly - definitely not intuitive for me and that's the only way I have to learn how to use my Bernina. I want a Bernina because I have heard so many wonderful comments about the machines and the company! My first bernina was a 165 and decided in 2006 to upgrade to a Bernina 730E. I love everything about this machine. The automatic thread cutter, knee lift, and it's so quiet, I can be sewing in the spare bedroom and it doesn't awaken my husband sleeping. I take this machine to all my classes. My bernina dealer (Berry Patch - Fort Worth, TX) is 35 miles from my house and they always have the answers to my questions. My machine loves aurifil thread. At some point, I would love to own a Bernina 750QE with the dual feed. Thank you so much for the chance to win this wonderful thread. Welcome back! I have missed your fabulous posts! And what goodies are you cooking up for market? Need a sewing elf? I don't have a Bernina, and I don't think hubby would let me shop now, but a girl can dream!! :-) Thanks for the awesome giveaway! Congrats on the clean sewing room. I don't have a Bernina, but I do have a Janome. I did try a Bernina with a stitch regulator, but it was a bit beyond my means. Congratulations on becoming a Bernina Ambassador. I'm so very excited. 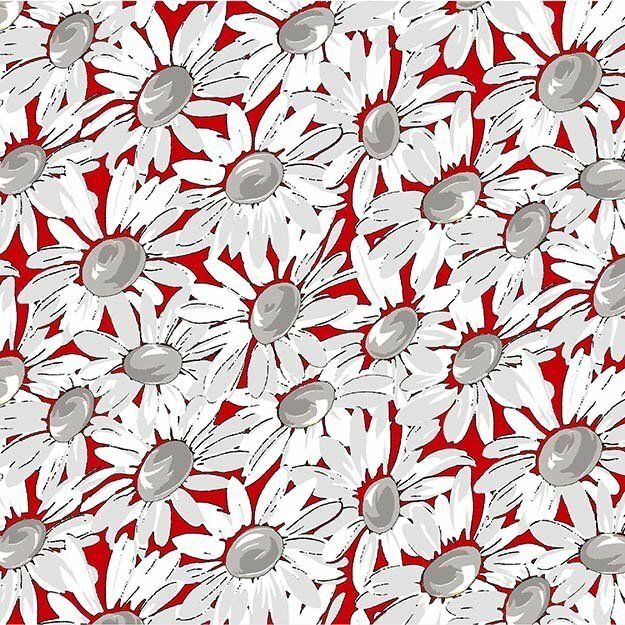 I love Bernina as they offer so many features and are typically quite easy to use and dependable. Although I still like to send my to the "spa" once a year for cleaning and pampering. I do not own a Bernina but have considered checking them out for my next purchase. My sister has owned one for many years and raves about their performance. Your "before" sewing room looks a lot like mine now. I am in the throes os trying to finish a quilt for one of my grandsons, and there is stuff everywhere! Glad you are excited about your new sewing machine! I know you will be a great ambassador!! I just bought a new older demo model 3 weeks ago- I've only done some piecing on it. Went to MQX and stopped at the Bernina booth-spoke with a representative there inquired about the embroidery module for my model- she had just found one within her storage area at her store-offered me a great deal. Just got home an hour ago from picking it up 4 hours away from me. I think it was meant to be!! Can't wait to start utilizing and learning all the capabilities! I bought a Bernina Artista 730e from a friend of mine that bought it at Market year before last and was intimated by it. She bought all the bells and whistles with it and just couldn't get the hang of it. I am so in love with it. I have only been quilting for about 3 years and was using a basic Singer which is now my travel machine. I have a Bernina that is over 25 years old and runs like a champ!!! It has even traveled with me!! I would love a sewing cabinet for mine but I am in love with the machine!! I have had the Bernina 750QE for 9 months and love it more every day! Each time I use it I learn something new and with each update it gets even better! My first Bernina was a 1260 and I still sew on it. I would love to have a new Bernina but 99% of my sewing is straight stitch and the 1260 just hums along. I don't have a Bernina but I heard they are amazing. Lucky you! I am fortunate to own two Bernina's. My first machine was a 930. I refuse to sell it. It is a workhorse! I gave it to my daughter to use. My second machine is an Artista 200 with embroidery. I love it! I also teach family and consumer sciences in Iowa and am fortunate to have all Bernina machines for student use!!! I don't have a Bernina. It was a bit out of my budget, lol. Maybe someday! Thanks for the chance to win! I do have one and I love the leather round foot! I'm a Pfaff enthusiast, but have many friends who firmly declare their preference for the Bernina. We meet in the Aurifil ground though. Our machines love it ... & so do I! Well, I think your sewing space is absolutely wonderful CLEAN, but oh so very usable even when in a bit of disarray. I can see how that window seat could be good and bad! LOL! Yes, I have a Bernina; it's great for me even if it's not a higher end model! I love lots of things about it...the smooth ease of sewing, quality that I can trust, and I know I would love the needle threader (if I ever knew how it works!) and the knee thingy that I can't use w/o an appropriate table. Oh well. I would LOVE to win the thread and your patterns! Thanks for the chance. I have a Bernina 440QE and I love it. I have it about 3 or 4 years now I think. It has made many projects! The only thing I don't like about my Bernina is I left it in Texas when I came home for the summer :( Not a good move. Already miss it. Also love Aurafil thread. Finished a spool today and cracked open another one. I don't own a Bermina. I sew on one @ a quilt festival. It's like driving a luxury car, smooth with all the bells & whistles! It is a fabulous machine. I have a Bernina 140 Quilter's Edition. It had a special Purple added to it and it had to come home with me 8 years ago. I Love piecing on it! At the time I got it for making automatic buttonholes and invisible zippers. Too bad all I do it Quilt Now! It's extra heavy but I like it. I was using it on my Bernina Quilting Table until I got a Viking 18-8 Mega Quilter. I couldn't wait for the Longarm Bernina has coming. If I had the chance I'd TEST one of those for them, lol Thanks for the Giveaway. I shared your giveaway on FB. I have a 3 year old Janome. Never have had enough money for a Bernina. I just got my 4th Bernina! Your before picture is not as bad as mine looks... I have uprooted my studio and un the middle of rearranging everthing. I will get the walls painted tomorrow before Easter festivities begin! I Love My Bernina! It is so much quieter and sews so smooth! I'm like you, I just got a Bernina 750 QE and still trying to learn it. This is my 3rd Bernina, I'm so addicted to them! Nice sewing room! I have a Bernina 440, 750, and an 820. Love them all! Thread is a must have ! Totally love them and use Aurifil ALL the time! I would like to own a Bernina someday :) I need a clean sewing room to think as well, yours looks wonderful! Thanks for the opportunity to win! I LOVE my old Bernina. It's so dependable and always ready for me to start sewing. Love your sewing room. Great space to create. I have a 750 QE also and I love it! I've taken a couple of classes and they really help. Thanks for the chance to win! Beautiful studio and I love the flooring! I don't own a Bernina, but I hear that they are great machines. Thank you for the giveaway. I have always wanted one just cant ever find the extra money. My dream is to have a Bernina someday. My old Elna has been very reliable but lacks all the special things that I would like to have for quilting. Your studio is beautiful. It gave me the nudge I needed to spiff mine up today! I didn't see to much wrong in your first picture. It looks like mine! I don't own a Bernina either but have heard great things about them. I like the ideal of the stitch regular! how cool that must be! I have a previously love 830. There's nothing I don't love about her! She's named AllieB after both my grandmothers that sewed. AllieB helps me create my quilts that go to sick children or families that have sick family members. I know AllieB and I have many miles to sew. So we will be busy again tomorrow. Thanks for the chance to win! I love the extra sewing space on the 750QE and the even feed mechanism. I have a Bernina 440 for about 7 years now. Love it! We both love aurifil thread. I do not have a Bernina but it would be wonderful to have one. I think I like the dual feed mechanism as my favorite feature! Have fun learning to use your new machine! 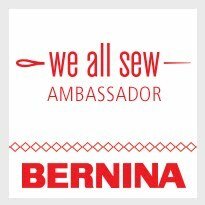 Congratulations on being a Bernina Ambassador ! Woohoo! I bought a used Bernina Activa 230 from my sister a few years ago. I love how quiet it is, its consistent stitches, and that I can take it places with me with no added back pain! Thanks for the awesome giveaway - just love Aurifil thread! I don't have a Bernina. I have a quilting friend who has one, and she absolutely loves it. Hopefully, I will be able to own one someday! I have a bernina 580. I use it for embroidery and piecing quilts... some day a bernina we with larger neck! I'm an Aurifil MASTER DESIGNER! LOVE this thread! Check out my collections! 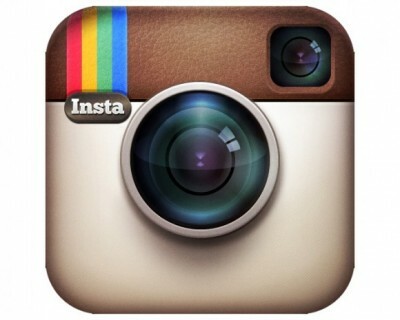 Subscribe here to my posts ! 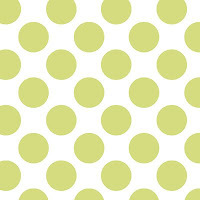 Click on a fabric swatch to see the whole collection! 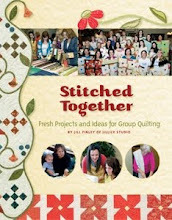 Click on the book to see some projects from the book or to order a copy.